Learning lessons, licking wounds and throwing the ball. A lot. We’ve been busy in the last few months preparing to expand Our Furever Family. I’m happy to announce two weeks ago we welcomed three chicks! Here’s a blog post about our latest adventure. Join us as the babies grow into chickens. Eggs are just around the corner! 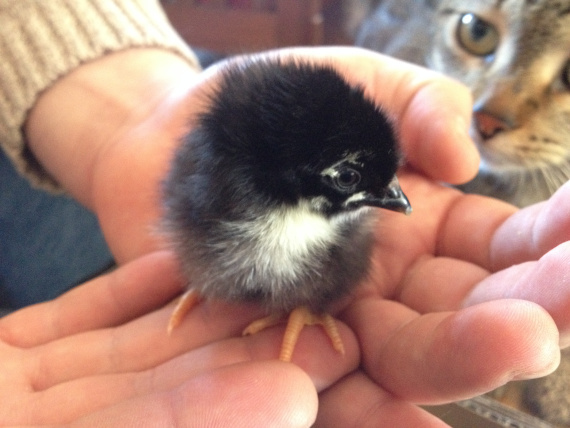 One of our chicks checks out the house, while Cora checks out the chick … from a safe distance. Jilli, just before picking up the chicks. After spending the weekend in Cleveland (most of it holed up in a hotel room because poor Matt is awfully sick) we got up early this morning to pick up the chicks. While we were finishing breakfast at the hotel, I received a cheerful call that the chicks were ready and waiting for us. 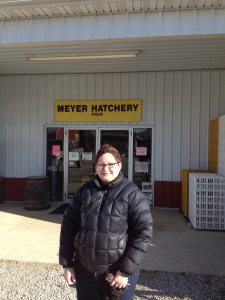 We drove an hour away to Polk, Ohio, where Meyer Hatchery is located. When we walked into the shop, a sound wall of peeps greeted us. This entry was posted in Uncategorized by ourfureverfamily. Bookmark the permalink.